Reinhard Grindel, one of the most powerful men in world football administration, quit on Tuesday after admitting he accepted a 6,000 euro watch from a colleague. The president of the German Football Association (DFB) stepped down after three years in charge. "I apologise for my less than exemplary behaviour regarding my acceptance of a watch," said Grindel. On Monday, German media revealed that the 57-year-old had received a watch from Hryhoriy Surkis, a honorary president of the Ukrainian football federation and a vice-president at European football's governing body Uefa. "For me this was an entirely private gift which I was bound to accept out of politeness," said Grindel. Surkis was on Uefa's executive committee with Grindel until last February. Yet Grindel denied that he had been given the watch for political reasons. "I am deeply shaken to have to give up my role as president over such an issue," Grindel added. "I ask myself: why has this happened? I can only say that I was completely convinced that I was doing nothing wrong and that, in the stress of my position, I did not question myself enough." 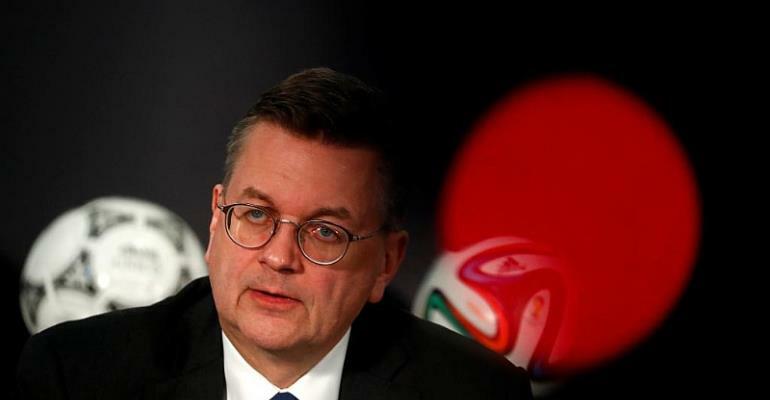 Last summer, after Germany's worst performance at the World Cup since 1938, Grindel came under fire from midfielder Mesut Ozil who accused him of overseeing a culture of institutional racism. "In the eyes of Grindel and his supporters, I am German when we win, but I am an immigrant when we lose," said Ozil when announcing his retirement from international football. Following Grindel's resignation, the DFB said that vice-presidents, Rainer Koch and Reinhard Rauball, would take over as joint interim presidents until Grindel's successor is elected.